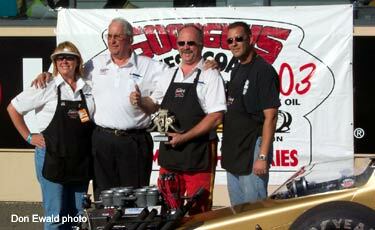 Kol Johnson got his first ever Jr. Fuel - B win in convincing fashion. 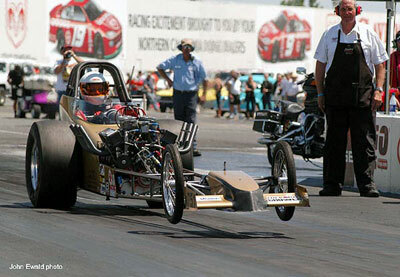 Johnson dominated the field setting low ET every round and winning the final with a 7.44 to Alan Hull's 7.64. 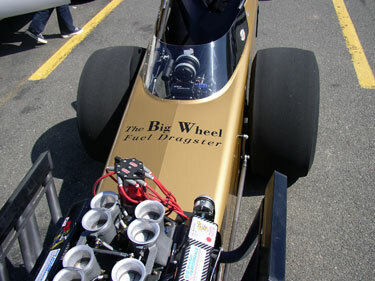 "The Big Wheel" Jr Fueler sits in the staging lanes prior to eliminations. By virtue of being low qualifier, Johnson got a first round single setting low ET again with a 7.363 @ 181.32. In round two (above) he slapped a huge holeshot on Bud Hammer (0.425 to a 0.528) and never looked back for the 7.468 @ 178.07 win. Hammer gave up and shut down to a 9.635 @ 88.66. 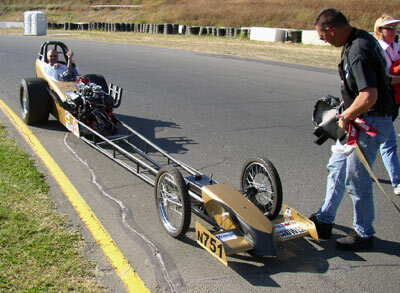 The Final was just a good old drag race. Both cars left together but Johnson drove away on the top end to card a 7.442 @ 177.72 to beat Alan Hull's game 7.647 @ 167.55. 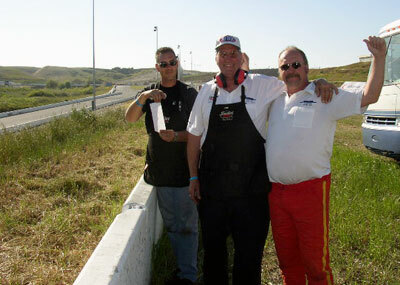 The crew, Marc McCormick, Ron "Big Yohns" Johnson and shoe, Kol celebrate on the top end after their first event win. It's time to tow the car back for those ever popular Winners Circle photos! Our last race was March Meet and we were runner up to Enriquez with a 7:378-182.22 to their 7:35 at 178 or so, Kol red lit. We went into this race intending to use the same tune-up, making only minor adjustment for weather. The air was better than at MM so we added a little fuel. On our first qualification run, the car misbehaved and Kol took it down track but ran in the 12:s. The trans-brake switch was faulty and replaced with one from Frank Parks. Yes, I ordered a spare from him also. There were only 7 cars there in the "B" field (OEM 23 degree valve angle heads) so we were in, but 7th. Second run was better, but we hadn't learned anything from the first run. 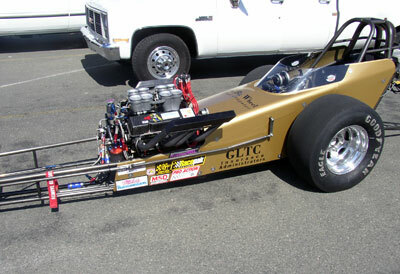 We had a 7:48 and 178 mph, top speed and low e.t. so far, so we were now #1 qualifier. We had a 1:099 60 foot and a 3:070 330 foot, which are both typical but not great. The tire tracks looked funky at the launch so we took some air out of the tires for the next run. We studied our data and decided we had over reacted to the air and went back to our baseline tune-up (same as the 7:37-181 at MM). 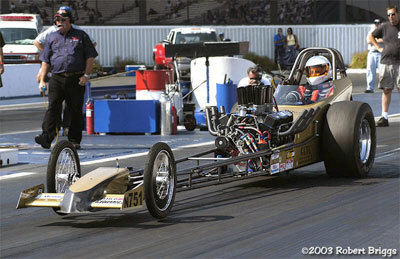 The car responded and in the first round Sunday, which was a bye run for us, we got a 7:363 and 181.32. This was the best e.t. that we have ever run, regardless of who was driving and we are 80 pounds heavier than when Mendy was in the old car. We slowed to a 1.110 60 foot but the 330 foot was better at 3:037. So, the car didn't launch great but it ran okay from 60 foot on. Kol had a 4:43 light. We let some more air out of the tires. We could also see, studying the data in our RacePak and by looking at the plugs, that we were still on the rich side. For the second run, against Bud Hammer, we put in a smaller main jet, but I failed to modify spring pressure in the high speed enough and so the car moved okay off the line with a 1:092. 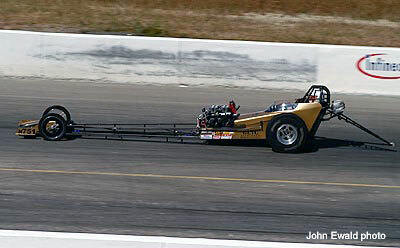 But it laid down at about 7000 rpm so the 330 foot dropped to 3:054 and at the end of the track we got a 7:468 and 178.07. Hammer had about a 7:80 and Kol had a better light than him also at 4:25, so we were in the finals against Allen Hull, a 7:60 car. Between rounds we were discussing what to do. We knew we were off, on the fuel in the upper ranges, 7000 and above, so we devised a plan. We were maybe 10 minutes from being called up, but thought we had more time. Then Enriquez called to see how we were doing. I told him what we had done and what we planned to do. He said to just go back to what we knew had worked before and stop trying to fine tune when we didn't need to. I decided he was right and so we were just starting to put everything back like it had been first round and Sally showed up to call us into staging. In about five minutes we rejetted, refueled and fired up and did a real brief realtime and went up to staging. In the rush to rejet, I put to much shim in the high speed and so it had at least 5 lbs. too much fuel pressure and didn't release until way too high rpm. We could have spent another 10 minutes easily in the pits without being late and maybe not made the mistake. However, it cost us nothing but maybe a little speed and e.t. Kol had another 4:25 light (Hull gated him with a risky 4:13) but Kol passed him quickly and we won. We had our best 60 foot, a 1:082 and a 330 foot time of 3:03. E.T. was 7:44 and mph was 177. It was just dead fat down track but we know what to do to put it back. I know there's a 7:20 in this thing and I want it. Only 2 cars have ever run quicker than us with 23 degree heads, McKray and Chrisman. Both have been about 7:28. McKray with a old set of Dart 2's that he has hogged out as a "life passion" and Chrisman with the same type of ProAction heads that we have. I think it will run 185 also. We have refined our technique for balancing left to right side throttle shafts and also front to back temps. On one run at the finish line the right bank 2-4-6-8 were within 10 degrees and the left bank 1-3-5-7 were within about 15 degrees and left to right averages were within 20 degrees. That's about as close as possible, but we're still working on that. It would probably run the high 7:20s and 185 just as it is, if we were at minimum weight but we're 55-60 pounds heavy. We're not going to get much lighter with this motor so we'll have to do it with tune-up and it's easy to see it's there. if we can just keep our s--t together and the weather is good, maybe at Pomona in late June. It's an evening race so we could have a chance to meet the goals. We won't have the performance advantage we enjoyed this race though. McKray will be there so we'll have at least one car to face who can run better than we have to date and you just never know who else's going to come out of the weeds. So that's the story. The RacePak computer is absolutely invaluable to anyone (like me) without years of experience like McKray and Chrisman have. Kol has gotten a firm grip on his job, three non-lifting passes with 4:43, 4:25 and 4:25 reaction times is as good as it gets. Nothing is hurt, the motor and driveline is all happy-happy. We'll probably change the oil, but that's it as far as between race maintenance. This is the way I was led to believe it would be in Junior Fuel. I'm happy too.